The Days Ahead: Jobs number on Friday. PMIs on Monday. One-Minute Summary: No drama from the Fed. Rates and bonds barely moved. Most stock markets were lower with economic sensitive sectors like financials and materials down 4%. China and America agreed not to talk for the time being. The Mexico trade deal looks good and Canada may join up in the next few weeks. We're often asked why trade is not a bigger issue for the market. It is a big deal but nothing irreversible or financially catastrophic has happened yet. Frayed patience and tempers for sure. But we've not seen many large companies come out and say i) it’s a major problem and ii) we don't know what to do about it. Another good quarter for U.S. equities. The rolling 1, 3, 5, and 10-year performance are all in double digits and the 10-year rolling return is now 11.5% compared to 10.1% at the end of the second quarter. That would turn a $100,000 investment into $293,000 and $261,000 respectively…a 12% improvement. Yes, time and small differences matter. Things are very different now. The Fed embraced “forward guidance” some years ago, and now talks openly about what’s going on and what’s going to happen. That’s all fine. The only trouble is that it may delay policy changes (because they won't have communicated it) and give the Fed less room to maneuver. That's not a problem right now. But in the next few years, there’s going to be a time when what they say they're going to do and what they must do will be very different. Growth: revised up for 2018 and 2019. They now agree with the Administration that we’ll see 3% growth in 2018. But they also expect growth to peter out sometime in 2019. In other words, very different from the Administration. We'd certainly agree on that point. It’s difficult not to see the current growth spurt as merely bringing purchasing decisions forward by a quarter or two. 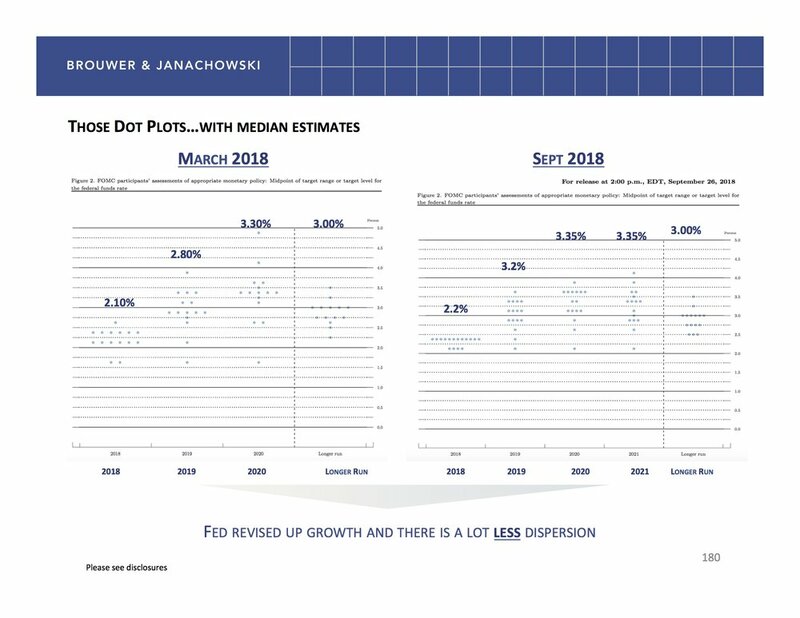 Rates: will top out at 3.5% in 2020, implying three more hikes in 2019 and two in 2020. It’s a bit hard to read (the Fed doesn't like graphic designers) but you can see i) the Fed Funds rate moving up by some 50bps more than they thought a few months ago and ii) more agreement among the Fed members. Back in March, the dots were more dispersed. Now they're clustered. The Fed Governors are singing from the same hymn sheet. Two more interesting points. One, Fed policy is still accommodative, in our view, even if they removed the actual word. The top lines show the Fed Funds rate and, in blue, the real Fed Funds rate (i.e. deflated by inflation). Anytime that's below zero, it’s an easy monetary policy. Two, the danger for the stock market is when tight policy starts to go easy, as in 2000 and 2008. We're a way off from that happening. So bottom line? Good for equities and a smooth upward rise in rates. We’ve been advocates of the front end of the curve. The 2-Year Treasury yields 2.83%. You only get paid 13bps more for investing in 5 year and 22bps for 10 years. 2. How’s the Japanese stock market doing? Is something you need not have asked in the last 27 years. As readers know, Japanese stocks had a spectacular 1980s, peaked in 1990 and have been on cyclical ups and downs ever since. An investor putting money in at the top would still be nursing a 50% loss today. Put those together with trade, ahem, talks, that mostly ignore or benefit Japanese companies, and we’re looking at a good outcome. Here’s the long term chart on Japan. 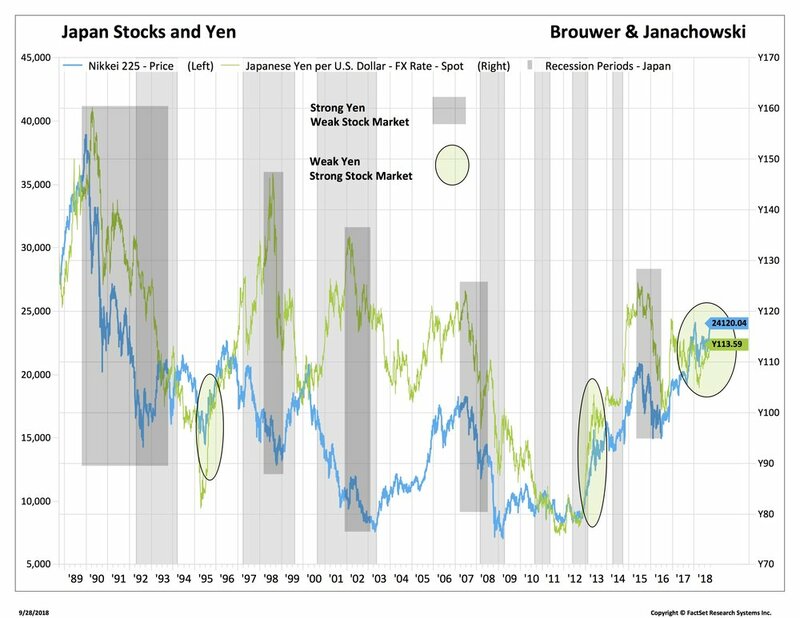 In the short term, it tends to move with the yen: weak yen, strong market. And that's mostly what’s happened since 2013. So far this year, Japan stocks are up 5% compared to the broad MSCI-EAFE market of -3%. It’s up 18% in local price and 8% to U.S. investors since the March lows. Japanese business is very competitive right now. It has become a major force in global M&A. Japanese companies have bought Shire (a major pharma company), Uber (through SoftBank), Irvine Scientific and Integrated Device Technology as well as our neighbor, Glassdoor. Japan’s small companies have done well…up 50% in the last two years and outperforming large caps by 18%. Small caps tend to reflect the domestic economy well. They're less dependent on the exchange rate. Did we mention, things move slowly in Japan? This isn't one of those rush-in-now-and-buy stories. But it does reinforce our confidence in Asia ex the China is-all-that-matters, which has not worked well in recent months. The deficit jumped from $72bn to $75bn, and way more than the $71bn consensus. This is enough to hold GDP back by 1% in Q3. The problem is that the tax cuts created demand which the U.S. cannot fill. No amount of tariffs will change that for the time being. 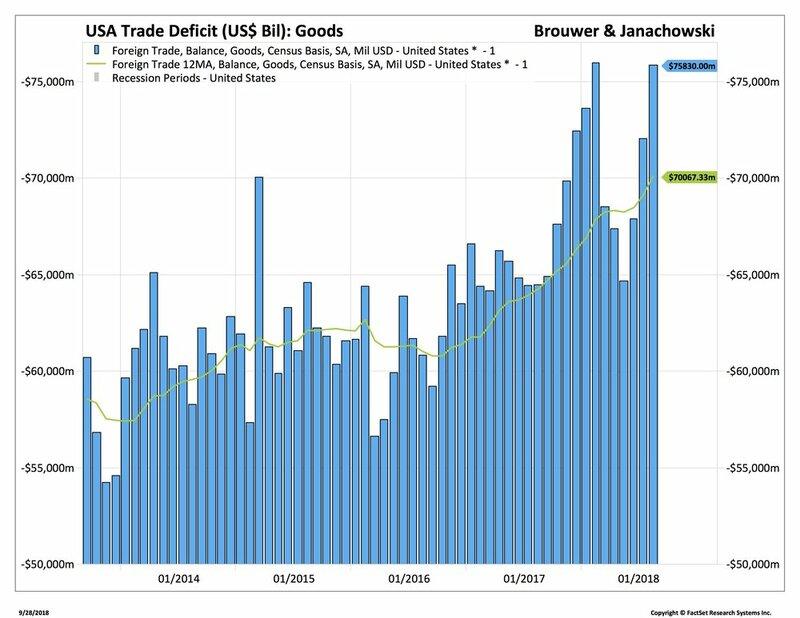 Trade is set to look worse in coming months. Bottom Line: Facebook and Tesla had a very bad week. In each case, it’s management not macro or business issues that did it for them. That’s a risk with some of the biggest tech stocks. Bonds will probably stay in narrow ranges for the next few weeks. Only a very bad employment number would upset the market. Alexa, what can I buy? The Days Ahead: Quiet data week. More M&A coming? Ouch. Don't let your kids grow up to be retailers. Over the last year, Macys, Target and Bed Bath & Beyond are all down 20% to 40% and even the analyst’s favorite, Costco, is barely above its 2015 level. This week it was Kroger’s turn in the cage...down almost 50%. I guess it’s all the themes of Amazon, ez-delivery, people moving back to the city, fewer car owners, less time, stricter zoning, more choice. I’ve always been hesitant on retailing as an investment. It’s brutally competitive. They seem to go through fashion cycles, margins are razor thin and companies are loaded with debt. So, Amazon taking over Whole Foods for $13bn is either i) the inevitable rise of online retailing and general disruption ii) the merging of warehouses with stores iii) a canny play on highly desirable locations iv) premium pricing meets value discounter or iv) the result of an activist/founder face off. We're not sure if the friendly farmer’s market approach of Whole Foods will fit with Amazon’s high-efficiency brand. But we do know this: it's a symptom of finding growth in a low growth economy. Elsewhere, the Bank of England sounded a bit more hawkish, probably because sterling’s 15% drop against the dollar and Euro in the last year may have inflation consequences. U.S. economic numbers were weak. We’ve hammered this point for weeks now but when housing starts, retail sales, the NFIB small business survey and industrial production all reported lower than expected, then you have to ask “blip or trend”? The Bank of Japan kept rates low, despite calls to back off on QQE (the extra “Q” is for Qualitative, nice touch). The Nikkei index is running steady at a 10-year high. And that’s it. They're the only choices. As we’ve noted before there is no inflation. Yes, it may come but there’s usually a lot of runway before inflation takes off. The Fed’s excuse would be, well, preemptive caution. Or it’s tilting at windmills. For the windmill case, we’d look no further than the “dot plots” or Summary of Economic Projections. The Fed expects growth at 2.1%, inflation at 2%, unemployment at 4.6% and Federal Funds at 3%. These are essentially unchanged from March 2017 and a year ago except they revised growth down. So, since the Fed embarked on its tightening cycle in December 2015, growth and inflation have been revised down. Granted, unemployment has also been revised down but by 0.3%, which is around 405,000 jobs. On a workforce of 160m. Speciously accurate, no? What will happen from here? The market will test the Fed and keep rates well bid. 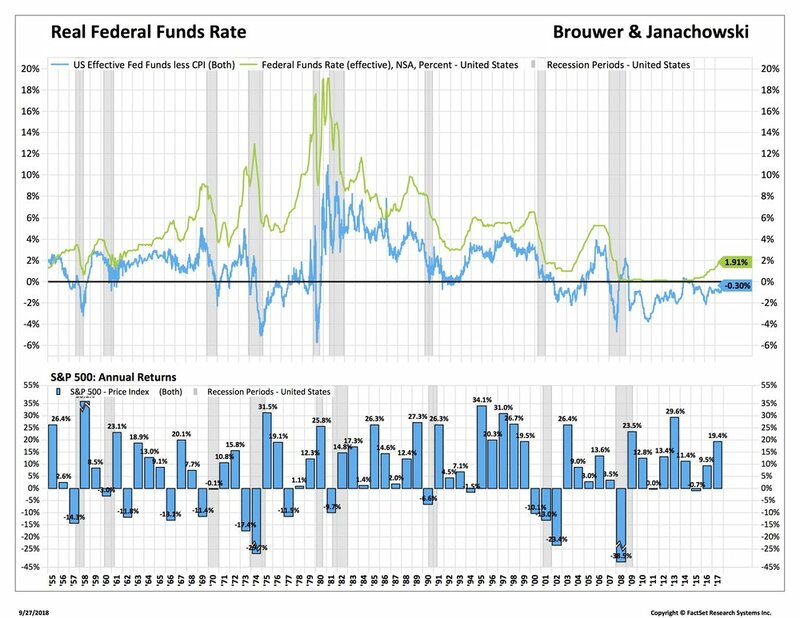 The market sees i) low growth and inflation and ii) monetary policy as already too tight given the real Fed Funds rate, which has risen noticeably this year. If we see weak numbers over the summer, and last week’s industrial and manufacturing production were pretty bad, then the expected third rate hike won't happen. Our hopes are on Neel Kashkari. So, we have to live with higher real rates and the prospect that some heat may come off risk assets for a while, especially after the S&P 500’s near 9% gain this year. 2. Japan: The Bank of Japan’s QQE is now around $3.9 trillion, which is a far bigger proportion of Japan’s GDP than the Fed’s program. And they own another $140bn of equities and corporate bonds. It seems to be working. Consumer confidence, employment, industrial production and chain store sales have all been strong in recent months. There have been many false dawns in Japan over the years. Not for nothing was the Japanese Government Bond known as the “widow’s trade.” But maybe this time is different. Japanese large and mid-cap stocks have performed well against the S&P 500 and, in the bottom chart, the S&P 500 remains nearly 25% more expensive than Japanese equities using a simple EV/EBITDA measure. We like Japan and have noted some of our managers moving their allocations up. Bottom Line: We're somewhat relieved to see the Nasdaq correction. It's off around 5% from its highs. As we discussed last week, it's not a bubble but simply profit-taking. We're reminded that the ETF tracking the Nasdaq was launched in 1999, promptly doubled, then fell 76% and took 17 years to recover. We're not seeing anything remotely like that. There’s more noise than signal in the market right now. Please check out our 118 Years of the Dow chart.